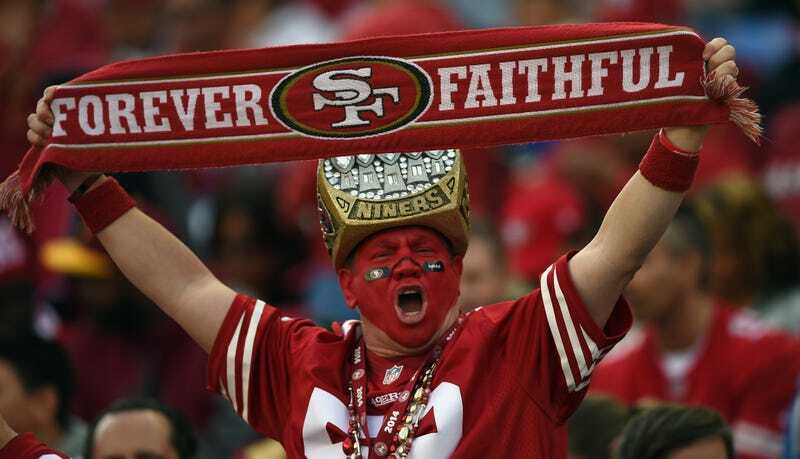 49ers fans can’t seem to go a week without involving themselves in an ugly brawl, and the Santa Clara city council is starting to get a little fed up. According to the San Francisco Chronicle, two council members have suggested the institution of a second-half booze ban at the stadium. [Councilwoman Lisa Gimor] said the council will explore several options, including increasing the number of police officers assigned to the stadium and halting alcohol sales after halftime. [Councilwoman Teresa O’Neill] said she might be on board with a second-half booze ban. The Santa Clara police chief told the Chronicle that his department usually makes about 30 arrests per game, but that he doesn’t foresee a second-half alcohol ban making much of a difference. He’s probably right; if football fans are good at anything, it’s finding creative ways to stay as shitfaced as possible while turning the stadium into a hell on Earth.